It’s often said; “when you meet one person with Dementia….you have only met one person with Dementia.” Although there may be overlapping characteristics, each person is unique in their Dementia journey. As care partners, it is up to us to support those we serve each and every day with a gentle touch, a kind heart and an uplifting attitude. 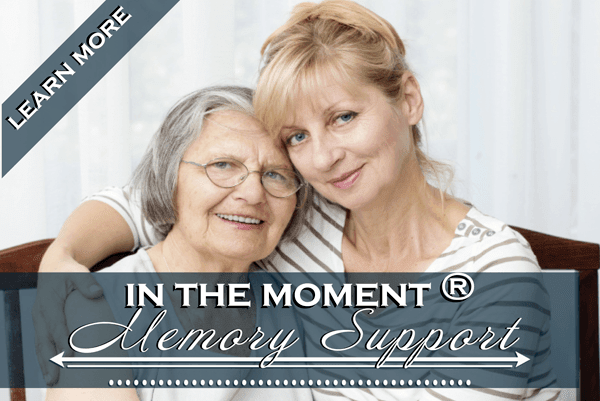 Our In The Moment® program is thoughtfully designed as a team-approach to Dementia care. We consider our team members as care partners, supporting our residents in their journey. Our custom-created training materials are our playbook for success. They guide each department within our communities, outlining their role on the team as we strive for championship- level outcomes. The framework of our In The Moment philosophy is based on the 6 Principles of Well-Being. This whole-person approach captures the essence of each individual through Physical Engagement, Spiritual Support, Artistic Expression, Community Connections, Continuing Education, and Lifestyle & Leisure. The information we gather through our Resident Well-Being Profile gives us a comprehensive understanding of each resident that directs our program planning. By discerning the unique needs of each resident, we create a supportive environment offering variety and support throughout their day. We proudly refer to ourselves as a Memory Support neighborhood and provide a nurturing environment where each individual is able to thrive, wherever they are in their Dementia journey.